It turns out this juggernaut has brakes after all. And the brakes are sticking at entirely the wrong time for Doncaster Rovers. This sticky patch has reignited a title race which many felt Rovers would already have won. They suffered back-to-back league defeats for the first time this season as they were beaten by play-off-chasing Wycombe Wanderers. Not winning in their last three matches has transformed the battle for League Two title from a one horse race to two and now three, with both Plymouth Argyle and Portsmouth able to overtake Rovers in the final two matches. Arguably more alarming than the run of results is the drop off in the level of performance from Darren Ferguson’s side. While they were the better, most threatening side in a first half they were unfortunate to end behind, they were incredibly lack-lustre after the break, lacking the quality and determination which carried them to promotion. With two games to come against sides still needing points for their respective goals, there is a very real possibility Rovers could lose the lead over the division which they have held since the first game of 2017. Rovers’ cause at Adams Park was hardly aided by poor, nervy defending, particularly for both Wycombe goals. Causing the panic was the imposing figure of Adebayo Akinfenwa – and the big man was involved in both goals. First, he got his head to Joe Jacobson’s long throw and flicked the ball on to the bar before Luke O’Nien dived in to head into an open goal. And for the second, Jacobson lofted a free-kick from his own half, Akinfenwa knocked down and O’Nien again found space volley home. On both occasions, Akinfenwa was given close attention by at least two defending Rovers players. Akinfenwa was not dealt with and O’Nien exploited space left by the increased attention on his teammate. It was frustrating, particularly as threat from Wycombe was otherwise minimal. There was plenty of good fortune as Alfie May equalised for Rovers on 18 minutes, his attempted cross taking a wicked deflection off Sido Jombati and looping over keeper Jamal Blackman. But the position May got himself in to force the opportunity typified his good work in the first half. 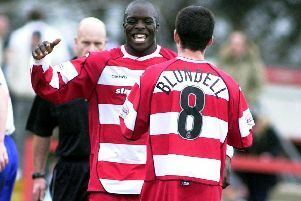 He ran tirelessly in behind, giving Rovers an outlet ball and also a starting point high up the pitch. It meant when May was forced off with a dead leg on 38 minutes, it was a significant blow to Rovers. Their game-plan could not function in the same way as the pace and direct running was absent with Gary McSheffrey sent on as his replacement. And they lacked bodies in the box in the second half as they attempted to force opportunities. On so many occasions this season, Rovers have only needed a 15 or 20-minute spell in which to show their true quality and see off the opposition. That has come through a rugged determination and a strong belief in the principals with which they enter the pitch. Right now, they appear to be lacking the levels of determination they possessed in their run to promotion. It comes in fits and starts but does not run through the full 90 minutes as it previously did. The hope is that with Plymouth now within touching distance, enough wind will have been put up the Rovers squad to jolt them back into the impressive mind-set with which they approached the first eight months of the season. It is time to slam the foot down on the accelerator and forget the brakes.